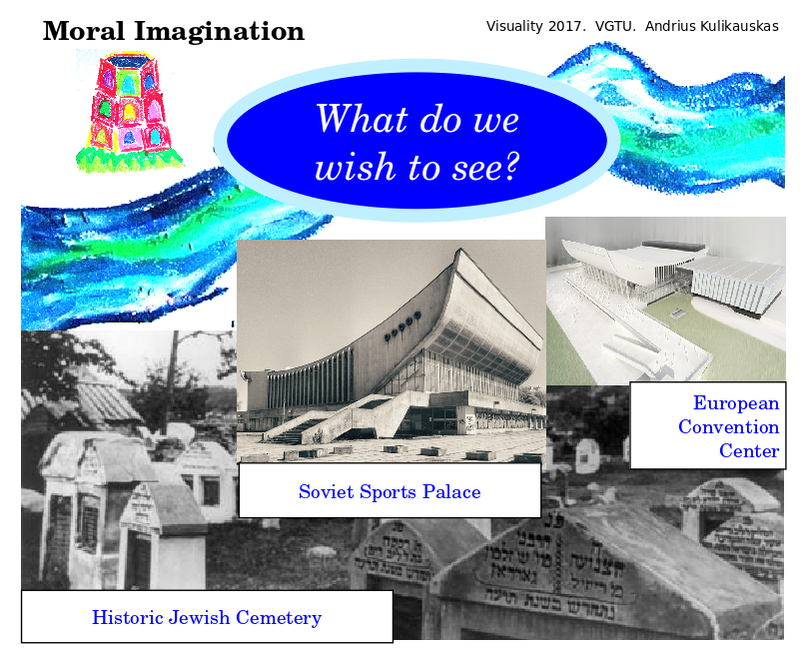 Moral Imagination: What Do We Wish to See? I am studying How do people behave? How should they behave? and as part of that, How do issues come to matter? or no longer matter? Today I will share what I am learning about the theoretical power of our imagination to produce and resolve a real life controversy. 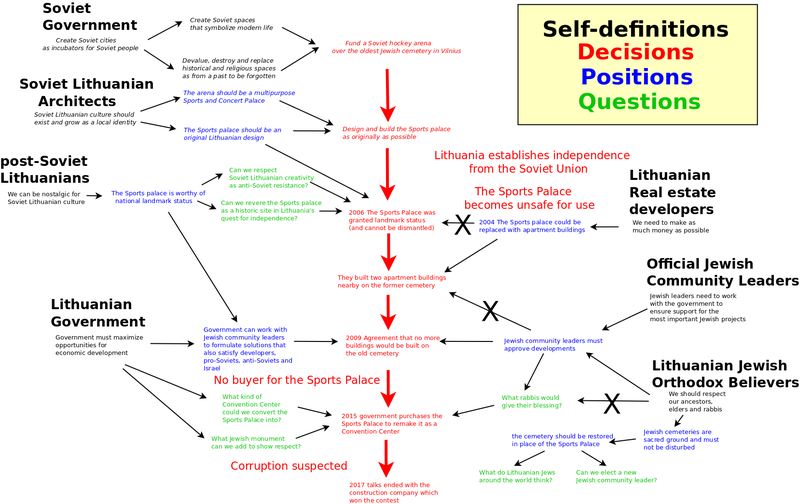 In particular, I analyze how a controversy in Vilnius arose and how it might be resolved. The question is whether the Lithuanian government will move ahead with its plans to convert a Soviet Sports and Concert Palace into a European Convention Center, or whether it will instead dismantle this building and restore the original historic Jewish cemetery, which the Soviets desecrated. 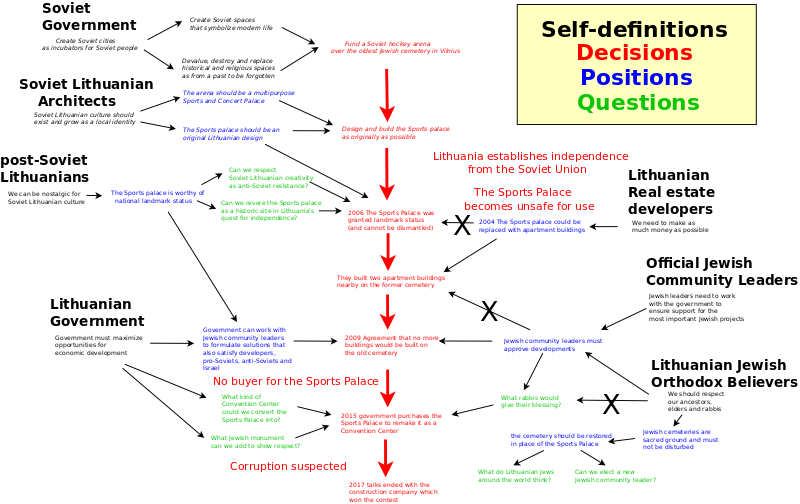 I drew a map of what this controversy means for 10 different allegiances, that is, 10 different self-identities. 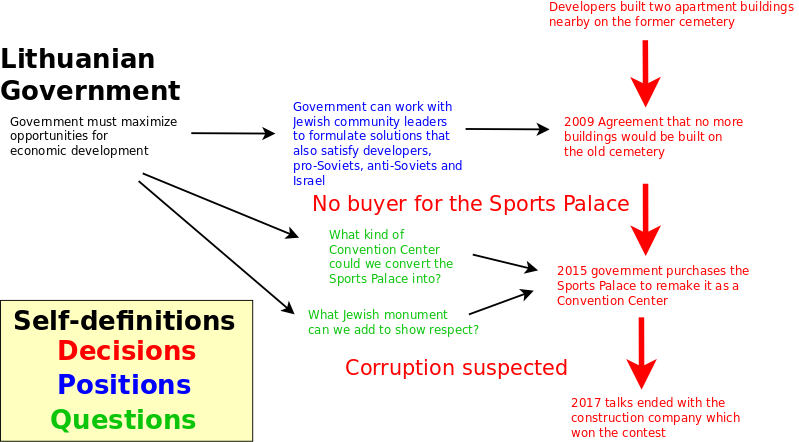 I noted several conflicts: the Soviet government vs. Soviet Lithuanian architects; post-Soviet Lithuanians vs. real estate developers; real estate developers vs. official Jewish community leaders; and most recently, the Lithuanian government and official Jewish community leaders vs. Lithuanian Jewish orthodox believers. I wondered how they might possibly change their positions, as might anti-Soviet Lithuanians, post-anti-Soviet Lithuanians and local residents. Of course, people may subscribe to more than one self-identity. I want to show how people with different self-identities, heritages, positions and inspirations may yet be brought together and held together by an abstract mental perspective and a concrete visual perspective. I thus sketch out a wider framework in which to consider how visual, sensual, visceral thinking may resolve conflicting forces serving urban heritage and tourism. 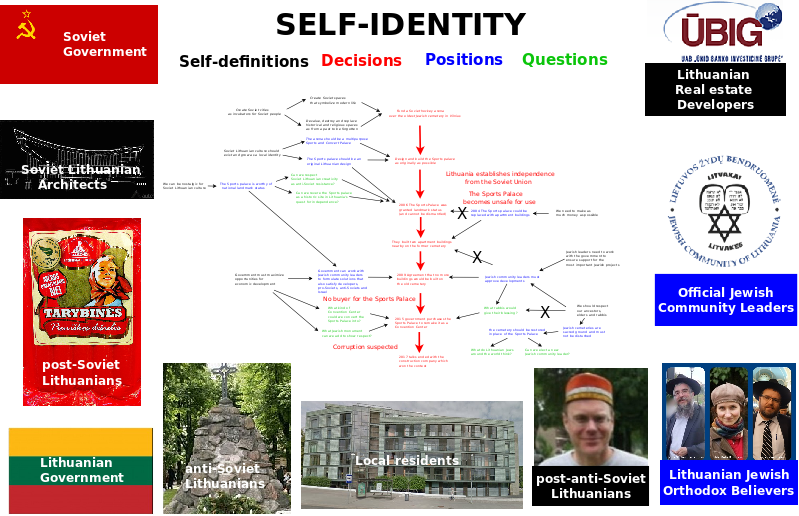 I mapped out the grounds for the positions taken by these various self-identities and then considered the ways in which their positions might change along with their self-identities. 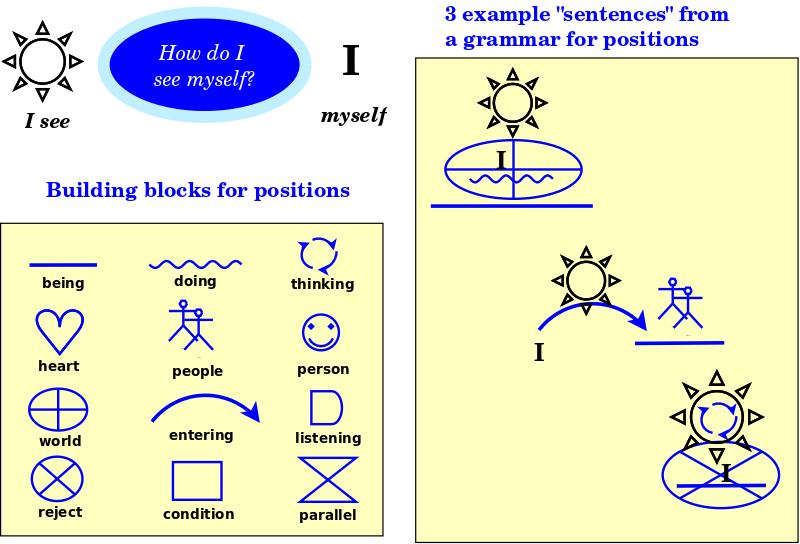 My map suggests that the arguments involve four types of statements: self-definitions, decisions, positions and queries. Self-definitions force us to be who we say we are. An anti-Soviet, by definition, believes that "Soviet culture should be completely undone". Decisions made command respect from others because they define our shared reality. The Lithuanian government's decision in 2015 to purchase the Sports Palace for 5.6 million euros places it in charge as the owner. Positions are opinions, observations and explanations that elaborate and rationalize one's identity but may ultimately be replaced with new positions. Post-Soviet Lithuanians believe that the Sports Palace is worthy of national landmark status and yet may some day change their minds. Queries are confessions of ignorance by which we let go of our own positions so that we can care about the truth: How do forces naturally align? What do we ourselves truly want? When and where do we feel whole, at peace? Self-identities, decisions, positions and queries can be countered by the four tones of voice - forcing, commanding, explaining and caring - which create tension in folk tales and other narratives. We could tear down the Sports Palace ourselves and force the government of Lithuania to cede authority. Or we could command the government, "Tear down these walls!" so that it revokes its decisions. Or we could give it reason to change its positions by explaining: "For the money you would spend on converting the Sports Palace, you could build a brand new convention center at an appropriate location, and still have enough left to restore the Jewish cemetery as a holy site, a national symbol of empathy for what we lost to the Holocaust, where we could truly feel that Vilnius will always be known as the Jerusalem of Lithuania." Or we can care by inquiring together with them: "Two hundred years from now, what do we wish to see from Gediminas castle, looking across the river: What the Communist party chief saw - the Sports Palace? 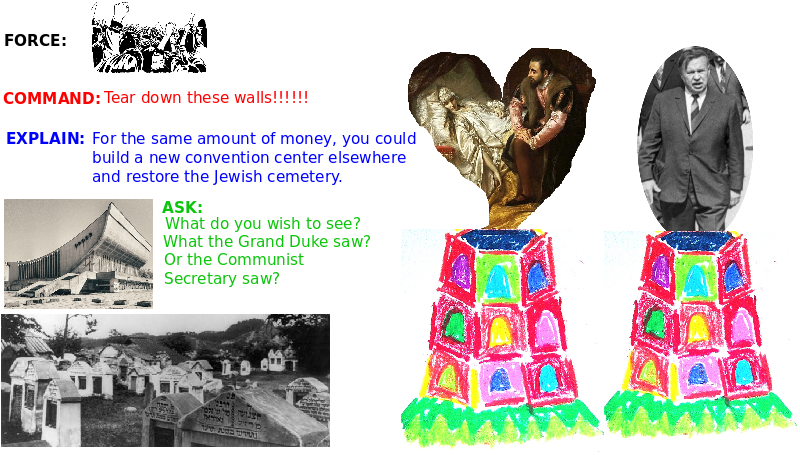 Or what our Grand Dukes saw - Vilnius's oldest Jewish cemetery?" Visuality enters here with four levels of knowledge - whether, what, how and why. In terms of semiotics we have the signified (whether) and, as Peirce noted, three kinds of signs: icons (dependent on sensory knowledge - what), indices (dependent on causal knowledge - how) and symbols (dependent on contextual knowledge - why). We can't truly come to agreement thinking like materialists because they argue about answers like Whether!, what they see - the Sports Palace, what resists change - their self-identity. We come to agreement thinking like idealists considering what can change freely, questions like Why?, the vantage points we are looking from - Gediminas castle - which let us see what we merely imagine - the Jewish cemetery - and the mystical aura it might have - like Lithuania's Hill of Crosses. 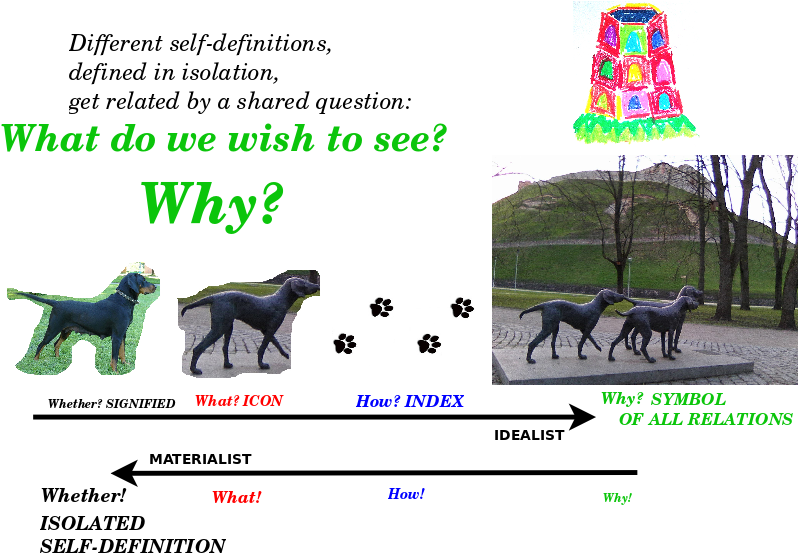 Materialists focus on behavior, how we do behave, whereas idealists consider morality, how we should behave. Our moral imagination frees us to empathize with a variety of mental and visual perspectives. We can appreciate why a statue of dogs may be loved by dog owners but condemned by Lithuania's chairman for UNESCO, Dr.Romas Pakalnis, as desecrating the cradle of Lithuania's nationhood, the Valley of Šventaragis. We can appreciate why the street nearby is named for Lithuanian patriot Kazys Škirpa, who masterminded the 1941 anti-Soviet rebellion, but we can condemn him on behalf of our country's Jews for his anti-semitic leaflets which promoted ethnic cleansing and contributed to genocide. Our moral imagination allows us to acknowledge our many self-identities but make decisions, construct positions and pursue questions that would unite us in harmony. Seeking such harmony brings to mind architect Christopher Alexander's investigation of What makes a building alive? Why do we feel at home, at peace, in an old building? Paradoxically, why can we feel alive in a historic cemetery, whereas a new building, built by professionals, like the Sports Palace, makes us feel dead? He concluded that modern buildings like the Sports Palace are built from blueprints, using standardized materials, with no personal interest in the inhabitants and their activities. Indeed, the dimensions of the Sports Palace serve the needs of ice hockey, the national sport of the Soviet Union, as opposed to basketball, the national sport of Lithuania. A building is alive when it is built organically, over time, by a series of patterns, each of which is a rule of thumb that resolves conflicting forces, for example, how to lay out the graves in a cemetery so that each is respected but space is not wasted. 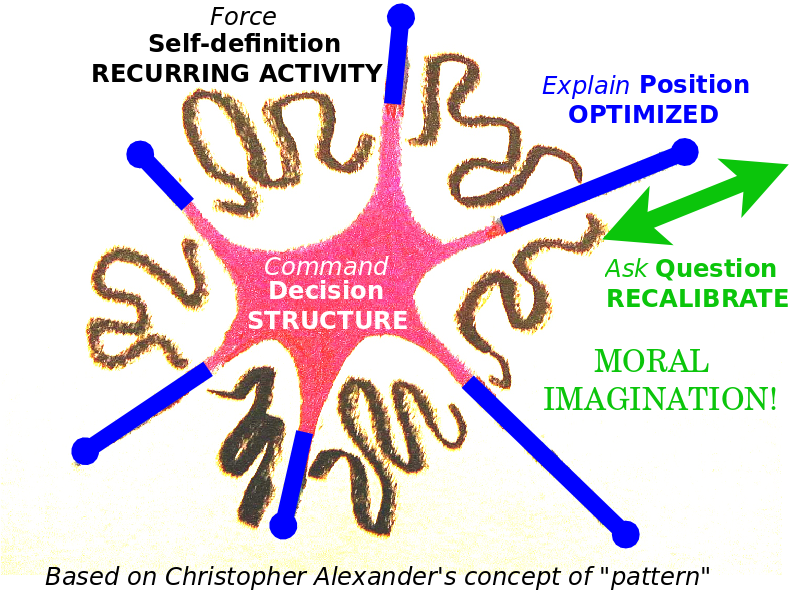 Each pattern is optimized locally so that structure channels activity, and recurring activity evokes structure. Similarly, we can think of decisions as patterns which structure conflicting forces, as when Jewish community leaders accommodate the Lithuanian government so as to maximize support for the Jewish projects they believe most important. We can think of self-definitions as expressed through recurring activity, as when Lithuanian Jewish orthodox believers stand up for their ancestors, elders and rabbis. We can think of positions as optimizations of decisions along various dimensions, as when real estate developers judged in 2004 that it would be most profitable to demolish the Sports Palace and replace it with apartment buildings. And we can think of questions as freeing us to recalibrate our positions so that we could consider what brings us peace, what makes us whole? In 2006, Soviet Lithuanian architects won landmark status for the Sports Palace by asking, Can we honor Soviet Lithuanian creativity as anti-Soviet resistance? Can we revere the Sports Palace as a historic site in Lithuania's quest for independence? In summary, we base our self-identity on our recurring activities, we share it through decisions that structure conflicting forces, we optimize our solutions with our positions, and we reconsider them with our questions. In conclusion, our self-identity consists of self-definitions, which won't change, but also decisions, positions and questions, which could change. I recently led a workshop to investigate How can I change my self-identity? We shared 26 episodes from our lives, and then distilled them using abstract pictures. Our self-identity changes when we grow aware of our circumstances which affect our view of ourselves and others. There seems to be an alphabet of 12 basic circumstances and a grammar which composes them. We can develop our moral imagination to arrive at a shared vantage point from which we can all appreciate why we are who we are.